The JVC FS-790PNACG Fiber Optic Transmission System for GY-HM790/890 has a custom designed camera back transceiver module that attaches directly to the GY-HM790/890 body using a hidden 68-pin connector and enables broadcasters to leverage the camera's full studio functionality in the field. It connects the camera via SMPTE hybrid (powered) fiber optic cable to a CopperHead base station, which is typically located in a control room, fly-pack, or OB van. 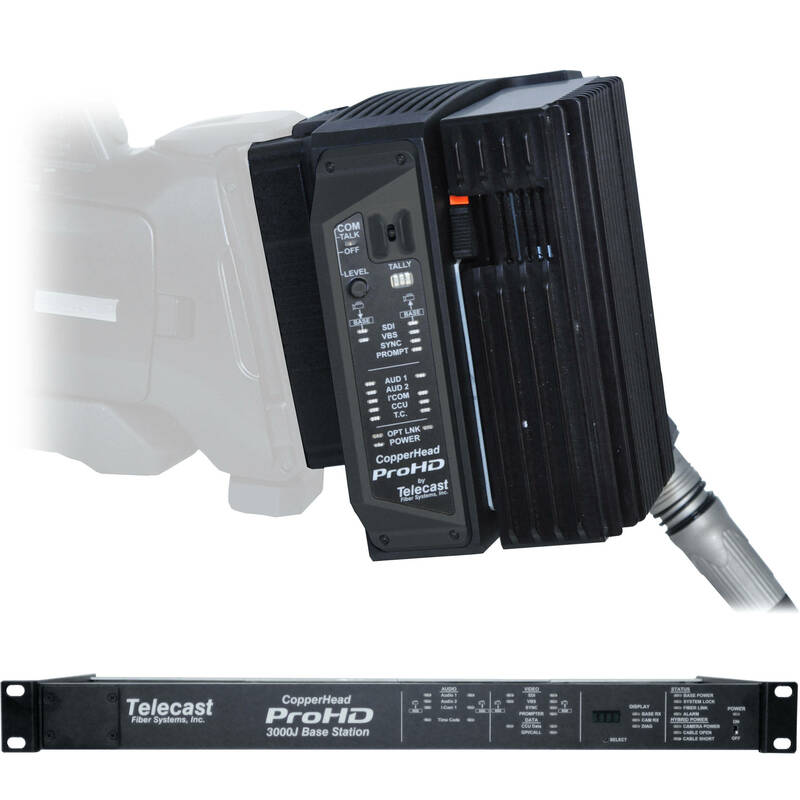 The system simultaneously transports bidirectional digital (SDI or HD-SDI) and analog (NTSC or PAL) video, as well as all two-way camera control, audio, video, data, sync, timecode, tally/call, prompter, and intercom signals between the camera head and the remote CopperHead base station. The lightweight, 1 RU CopperHead base station is designed to be easily integrated into any studio, mobile truck, or portable flypack, and plugs directly into a facility's switcher, router, intercom, and house sync systems. The JVC KA-F790 Remote Fiber Adaptor is used with the JVC GY-HM790 full resolution HD progressive camera and connects it to the CCU base station. The remote fiber adaptor attaches to the 68-pin chassis connector of the GY-HM790 HD. Ideal for use in studio/EFP applications, the fiber adaptor does not require any external cabling and offers a clean interface without clutter. The KA-PW790AG Power Wafer from JVC is a camera-side power wafer with an Anton Bauer mount designed to be used with an FS-790PNARG, FS-790PNACG, FS-790PSARG, or FS-790PSACG fiber optic multiplexing system. The VC-P790RMG Camera Remote Interface Cable from JVC is designed to connect the JVC RMLP25U, RMLP55U, or RMLP20G (Venetex) remote control units to the FS-790TNRG, FS-790TNCG, FS-790PNARG, FS-790PNACG, FS-790PNVRG, FS-790PNVCG, FS-790PSARG, FS-790PSACG, FS-790PSVRG, and FS-790PSVCG fiber camera remote control units. The JVC RM-FP790PNCG Powered Fiber Base Station with Neutrik opticalCON Connectors & Clear-Com Compatability powers the JVC the FS-790PNASG or FS-790PNVCG fiber remote system used with your JVC FS-790 camera. Box Dimensions (LxWxH) 8.3 x 6.2 x 4.7"
Box Dimensions (LxWxH) 6.9 x 6.8 x 0.3"
Box Dimensions (LxWxH) 22.0 x 11.0 x 6.0"